Away from all the crowds and purpose-built ski resorts, Red Mountain boasts some of the best powder skiing in North America. Unfettered by overdevelopment, the resort boasts a distinct lack of crowds, fresh lines, and a rich mountain tradition. The resort itself is one of a kind, with 360 degree descents, incredible off-piste, and in-resort cat-skiing. Wide-open groomed runs, epic vertical, annual snowfall of almost 7.6m, and the best tree runs in BC, it's truely a wonder that Red has remained under the radar over the years. Canada's best-kept secret has to be explored to be believed! Great compact base area in a historic old mining building. Don't pass up cat-skiing available at the resort. Catch the lifts to the top, pay $10, and experience great off-piste skiing back down to the resort. Lifts are mostly slow and old, but given the amount of snow and lack of crowds, you'll enjoy the rest. Fantastic for intermediates to expert. The village base area is small, with only a few restaurants and bars for apres. Perfect resort to add to an itinerary with other nearby resorts, like Fernie & Whitewater. A little history for you... Back in the 1890's, a group of avid skiers in a small mining territory in British Columbia, banded together and with the combination of community resources, support, and good old-fashioned elbow grease created one of the best undiscovered ski destinations in the world, Red Mountain Resort. Over the years as skiing technology improved, the resort slowly grew in size, yet remained relatively under the radar among the skiing community. Fast forward to present day, Red Mountain boasts almost 4200 acres of pristine skiing, still operating out of a small resort area, unfettered by overdevelopment. Incredbile powder skiing with a small mountain town vibe that's full of tradition. This is why we LOVE Red Mountain Resort. Red Mountain feels like a true locals mountain. Fantastic skiing, huge amounts of terrain, and endless paths to explore. Being considerably underdeveloped compared to the other larger resorts in Canada (a.k.a, Whistler) there are fewer amenities and facilities at the resort base, however, there is everything you need for your ski holiday in the one convenient day lodge location. This makes everything a bit more affordable, and you experience real local hospitality as it should be. The mountain itself being spread across 3 mountains means it takes a day or two to really explore the entirety of the resort area, and find those favourite runs to lap. The powder snow is phenomenal, and the distinct lack of crowds meant fresh tracks could be found days after the storm. There was no rush to get up the hill on a powder day as there was definitely plenty to go around. The chairs at times were a little slow, however, the rest time was appreciated after skiing incredible fall-line trees, and the views of the surrounding mountains were enjoyed a bit more. Scatted throughout the woods we found unique little wooden cabins, where you can stay overnight (if you're truely after a Canadian mountain experience!). We recommend finding a mountain host who can take you to them, and they are nice spots for a rest throughout the day on the slopes. 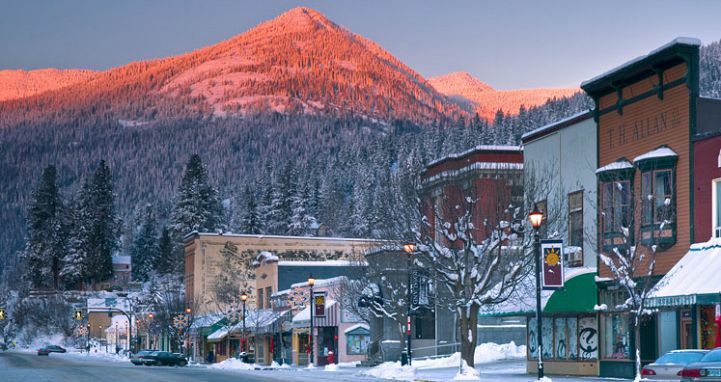 The town of Rossland is a great, laid back, historic village, with a fun mountain vibe. Influenced by the smelters near by, Rossland is an old mining town, which is reflected in the cool restaurants and bars in the main street. Friendly locals, great produce, and all round relaxed atmosphere. In recent years, Red Mountain has left private hands and has opened the opportunity for skiers and snowboarders to own a slice of the world-class ski resort. By investing in Red, you basically become part of a large-scale ski club, and invest in the future operations of Red. It's a stand by local skiers and snowboarders to remain independant of larger corporations that own many of the ski resort world-wide, and hold true to their traditional roots and beliefs. Read more about this incredible campaign here. Thanks to considerable terrain expansion over the past 10 years, Red Mountain has really popped up on many skiers radars as a must-ski powder destination. Spread across 3 mountains (Granite, Red, & Grey Mountains), plus an extra peak of cat-skiing terrain, Red provides a good variety of terrain for all ability levels. Wide-open groomed runs, inbounds cat-skiing, & perfect tree runs; over 110 varying courses that allow you to explore 360 degrees of the largest resort peak, Granite (Red Mountain itself has a 270 degree descent). A vertical drop of 890m also means super fun freeskiing and long interconnected runs from peak to base. The highlight has to be its incredible fall line free skiing, with Red boasting some of the best gladed tree runs in North America! Advanced and expert powder fiends have an endless number of lines to ski, with powder conditions that generally last well into the afternoon. Well-spaced trees allow for a perfect introduction to those new to powder skiing. For the best powder runs, head over to Grey Basin on Granite Mountain, with plenty of steeps, chutes, and tight trees to make you feel like your way out in the backcountry. Red itself also has some steep pitches to explore, with Paradise, Pale Face, & War Eagle our favourites to ski. At 2877 acres of pristine skiing, Red already has most of the desired terrain covered, however the resort also runs snowcat shuttles daily from the top of Grey Mountain, allowing access to an additional 200 acres of powder skiing. A mix of off-piste open slopes, wide trees, and a bounty of fresh lines, this area offers amazing skiing options for advanced skiers. This zone is patrolled and avalanche managed, so all you need to focus on is choosing the best line! Mr Kirkup Cat Skiing is only $10 per person per ride, and operates daily 10:30AM – 2:30PM. Only about 18% of the resort is suited to Beginner and families are recommended to stick to the Grey and Granite Mountains, with plenty of green run options. Some of the longer runs are definitely leg-burning, so can be a bit exhausting for the little ones to complete peak-to-base runs. Terrain park-wise, the Rockstar Park boasts progressive new features and setup, including a huge wall ride, and is super close to the main base area. The snow quality at Red varies between each mountain in the resort, but powderhounds are generally chuffed with the heavy snowfall (up to 7.5m annually), especially when it's a good ol' BC powder day! The best part about this unspoiled resort is the distinct lack of crowds (it's almost unbelievable to be honest), so no need to fight for fresh lines. Red Mountain has all the standard facilities and services one will find at the base of a resort, all conveniently compacted into a large day lodge. The one bonus is all the amenities are relatively affordable, including rentals, childcare (available by the day, half-day, and hour), and rentals. There are a range of cafeteria style options and smaller cafes for lunch options, with a variety of food to suit even the most picky eater (from soups, to sandwiches, burgers, and other goodies). 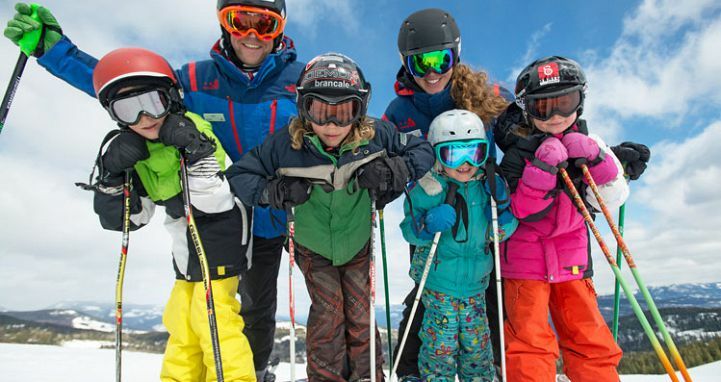 The Snowsports School offers a great range of group and private programs for kids, and the beginner lessons include lift tickets and rentals. Lesson are available from the age of 3. Unfortunately, there are no standard group lesson options for adults other than beginner levels. Staying on-mountain is defintely more convenient for families, however, if you require a few more options and access to supermarkets and local restaurants, staying in Rossland is recommended. The free resort shuttle from town to the base area is only a 5 minute drive. For families and those who simply want ease of access to the slopes, staying on-mountain is a great option. There is a variety of cabin, lodge, and condo accommodation options to choose from, many with hot tubs, and either slopeside or only a short walk to base of the resort. The only downside to staying on-mountain is the lack of restaurant and bar options at night, which can get a bit repetative after awhile. Slalom Creek is a perfect choice for those wanting ski-in/ski-out and a bit more luxury to their ski holiday, while Morning Star caters to a mid-range budget and is slopeside. The new Josie Hotel opening this season at the base of the resort provides another wonderful choice for on-mountain accommodation, and comes with a stunning outdoor slopeside pool to relax in after a day on the slopes. A lot of skiers choose to stay in nearby Rossland, only a few kilometres from the resort. It's only a small mining town, however, it's rich with tradition and the locals are friendly and laid-back. There is more variety in the way of nightlife, shopping and facilities, and you'll experience true Canadian mountain town culture. Rossland has accommodation ranging from hotels, motels, B&B's and hostels, as well as more deluxe rooms and suites (some with kitchenettes) at the Prestige Mountain Resort. Being located along the 'Powder Highway' has its advantages when it comes to extra activities for the skier and snowboarder. There are a number of world-class cat-skiing and heli-skiing operations near Red Mountain, perfect for those wanting to tick off their bucket list. Big Red Cats is one of the world's largest cat ski operations, with over 20,000 acres of untracked glades and bowls to explore. Ski between 10-18,000 feet of vertical per day under the instruction of qualified guides, and experience the famous BC powder without the hefty price-tag. Snow Water Heli-skiing are a well-known operation near Red. Jump in the heli to the peaks of one of the 3 mountain ranges and ski incredible alpine bowle, steep chutes, glades, and perfectly spaced trees - and of course, champagne powder! Experience the ultimate in backcountry skiing with an incredible 3 or 4 day trip to the historic Baldface Lodge. We'll known among the skiing and snowboarding community, Baldface (created by snowboarding legend, Craig Kelly) is a cat-skiing mecca. Fly via heli to the lodge for an all-inclusive, once in a lifetime skiing experience. Red Mountain and the surrounding mountains and valleys also offer fantastic cross country skiing, as well as plenty of backcountry touring options. Summit Mountain Guides are highly recommended for those wanting to take their skiing to the next level and seeking a more personalised backcountry experience. For the families, Get Lost Adventure Centre offers a range of fun activities for those down days at the resort. Try your luck at fishing, join a cave tour, or take a white-water rafting adventure through the wilderness. Red Mountain is located along the famous 'Powder Highway', just outside Rossland, British Columbia. This region of BC, which also includes the likes of Revelstoke, Whitewater, Kicking Horse, Panorama, and Fernie, is renowned for incredible mountains, mammoth amounts of powder snow, and some of the best backcountry heli-skiing and cat-skiing in the world. The easiest option is to fly into the closest airport, Castlegar, and jump on one of the daily resort transfers (barely 35 minutes drive to Red from the airport). Airport transfers are also available from Spokane (located in Washington state, USA), but a great option for those on a multi-resort trip. If staying in Rossland itself, there is a free resort shuttle bus to get you up to the mountain each morning and back in the afternoon. It can be a little crowded with locals and visitors alike, so we'd recommend getting up earlier if possible. From Vancouver or Calgary, it's about a 7 hour drive, however, if you have the time we'd highly recommend the trek. Some of the best scenery in Canada is along the 'Powder Highway', and you can experience some wonderful local mountain towns and hospitality along the way. With almost 7m of average annual snowfall, anytime is a great time to go to Red Mountain. The resort opens 09 DEC and runs through to the start of April. February and March are best for powder skiing, and have clearer weather (more bluebird days! ), perfect for cat-skiing and heli-skiing. January can be bitterly cold in British Columbia.